These tiny little flowers blossomed today and the red mites found them immediately. 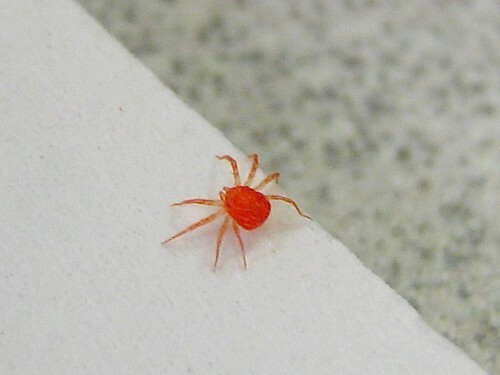 The mites are very small – pinhead size or maybe a little smaller. 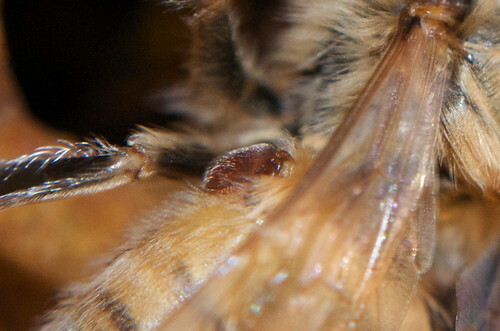 This was shot with a Raynox DCR 150 or 250 lens. Then I got out my camera so I could get a better look at the spiders. Even zooming in a bit, they still were sort of cute … but not so cute as before. 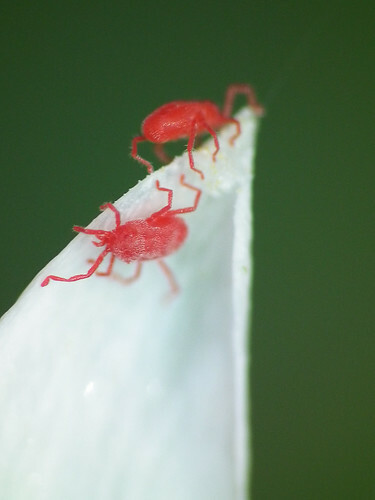 11 June 2008 – Just learned today these are mites. View On Black. Gotta see this large! This is the girl that just emerged! Looks like I’ll need to take a mite count, and treat as necessary. What to treat with, you ask? Powdered sugar is one natural treatment. Then there are medicated strips that I can insert into the hive. The other treatment is a gas-type that is formic acid. If it were spring or summer, I’d break the mite cycle by killing the queen, or relocating her. Once this is done, eggs stop being laid in the hive, and the mites end up dying off quite naturally because they don’t have any larva cells to hide out in.